I first listened to his music when he was still with the Smiths. He is one of my all time favorite musicians. Him coming to a concert in Manila is huge, but at a short notice, I don’t think I could make it. Thanks for the useful information. I am surprised that Morrissey will visit Manila. I have been on a holiday in the Philippines and I am sure he will be welcomed there. 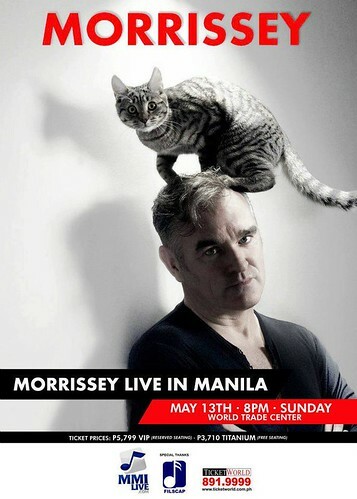 Nice info, Morissey, the former lead vocalist of the New Wave band “The Smiths”, will be doing a live concert show here in Manila, Philippines on May 13, 2012 @ World Trade Center.